Discussion in 'Lets Talk about gambling and more...' started by Marina, Mar 31, 2015.
to six people, involved bluffing, and allowed for some interesting betting strategies. It’s a good game to learn some additional poker tricks, especially regarding how to bluff and choose cards wisely. The game can be played with a 52-card deck but without the eights, nines, and tens so you will only have one through seven. Unlike poker, the cards are scored to avoid ties. All face cards count as ten points. Cards two through five count as ten plus their value (for example, a four is worth ten plus four, or fourteen). Aces count as sixteen. Sixes and sevens count as three times their value (eighteen and twenty-one, respectively). Primero: This is achieved when you have one card of each suit. Unfortunately, in today’s poker games you’d jus have a high card since this hand is impossible to get. Maximus or Supremus: If a player receives an ace, six, and seven of any suit, they have a maximus. This is named as such because it scores the maximum number of points with different cards. 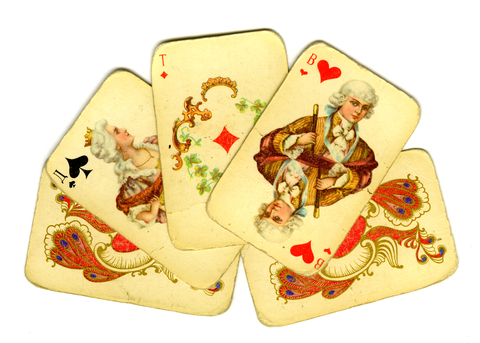 Fluxus: A fluxus is when a player has all cards of the same suit. A fluxus is the equivalent to today’s flush. It should be noted that only the cards relevant to the creation of the hand are scored. For example, a numerus made of two fours, a queen, and a five only equals “numerus 28”. As with poker, every game starts with a standard ante, the price for admission. Then the dealer deals one card counter-clockwise to each player until everyone has two cards. Once every player has two cards the players decide whether they would like to bet, cover, or pass. A bet is when a player bets and announces the cards and score they have (for example, a “fluxus 56” for two twos and two aces, all of the same suit). The betting player may also bluff and call out a score or hand lower than they have. For example, that same player can say “maximus 68” or anything else up to a “fluxus 56”. A player can only cover after another player bets. When this happens, the covering player must first cover the previous bet, and then announce their hands or bluff, then add additional money to the pot. After a person announces their hand they are no longer allowed to draw cards when passing, so care must be made to get the best hand you can first. A player can also pass. When a player passes, they do not bet but they must discard and redraw. They are only allowed to discard up to two cards and pick up the same amount of cards that they discarded. bet additional money if they so choose. again until there is a winner. One of the interesting things about the game is that the pot is divided among the three highest hands with the remaining staying in the pot and being used as an ante. It is unclear how the pot was divided in antiquity. from differing sources so it’s worth taking a look into how different regions played the game in order to get a fuller grasp on Primero as well as modern day poker. Ellis, Mike and queenmap like this. Ellis, Mike and Marina like this. Never heard of this game either! But it sounds really fun! queenmap and Marina like this.